Denny Hamlin’s promising start to the Auto Club 400 ended early on Sunday, as an engine failure in the #11 Toyota forced the FedEx Racing team to retire from the event after just 105 of 200 laps. Hamlin started second and needed just seven laps to pass polesitter Juan Pablo Montoya, and was out front for the next 15 circuits. Staying in the top-five for the first two cycles of green flag pit stops, Hamlin battled a tight race car but remained in contention. Differing pit strategies during the race’s first caution on Lap 76 shuffled the #11 back to 12th for the restart, and just three laps later, Hamlin radioed that something was amiss and fell to the tail end of the field. A series of checks on the track and on pit road during the next caution revealed the issue was in the engine, and the team pushed the car to the garage, where they determined it was terminal. As a result, Hamlin was scored in 39th for the race and dropped four spots to 21st in the NASCAR Sprint Cup standings following Auto Club Speedway. Despite the early-season misfortune for the #11 FedEx team, Hamlin keeps a positive outlook heading into Sunday’s race at Martinsville (Va.) Speedway, and for good reason. The 30-year-old Chesterfield, Va., native has won four races at the 0.526-mile ‘paper clip,’ including the last three in a row. Hamlin has been dominant at Martinsville in his career, finishing in the top-five in eight of 11 starts at the track. Hamlin swept the two races at the track in 2010, starting on the pole and leading 40 laps en route to victory lane in the fall race. The spring race saw a determined Hamlin charge from ninth to first in four laps for the win, just two days before undergoing reconstructive knee surgery. Hamlin earned his first victory at Martinsville in the spring 2008 race, and won again in the fall of 2009. In total, Hamlin has led 949 laps at the track, and has only one finish worse than eighth (37th in 2006) in his career. 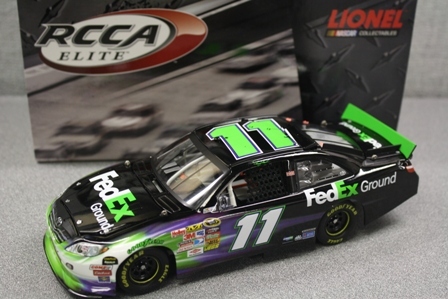 The FedEx Plains District continues to lead the way in package care and will be recognized for the second time this season with its “PLNS” letters on the b-post of the #11 FedEx Ground Toyota this weekend at Martinsville. The district encompasses all of Kansas and Missouri, eastern Nebraska, and much of Iowa. What has been your key to success at Martinsville? How important is it for the FedEx team to have a solid run this weekend?